It is true that for many of the wonderful Gospel Hymns and Songs we know and sing, it is the combination of the words and music that thrills and blesses us. 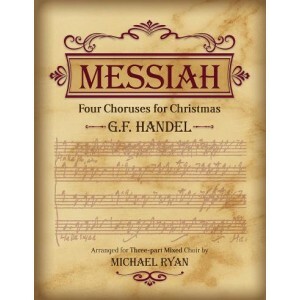 No less so than in the music we know as Handel’s Messiah. All we need to hear are the first few notes or words and immediately, our spirit is touched. But in truth, Handel’s Messiah should be better called Handel’s and Jennens’ Messiah. We shall see why. Handel was born in Halle, Germany, February 23, 1685, the son of a barber-surgeon. He showed an early gift for music and learned to play the violin, organ, harpsichord, and oboe at an early age. He also learned the principles of keyboard performance and composition. But George Handel’s father did not see that music was a way to support a family and he wanted more for his son. His plans were for his son to be a lawyer and he discouraged George’s study of music at every turn. In order to please his father, George studied law until he was 18, even though his father died when Handel was 11. His musical ability would not be denied. During the next five years, he was employed as a musician, composer, and conductor at various courts and churches throughout Italy and Germany. During one period, he also was the organist of the Reformed (Calvinist) Cathedral (Market Church) in Halle, known as The Cradle of the Reformation. In 1710, at age 25, he was appointed orchestra and choir director to the Elector of Hanover, the future King George I of England. In 1712 Handel moved to London and became a permanent resident. The next year, he gained royal favor with his Ode for the Queen’s Birthday and was granted an annual allowance of £200 by Queen Anne. In February 1727, he became a British subject and was appointed composer of the Chapel Royal. His life had many interruptions but the year 1741 gave the world what many consider to be his greatest oratorio, Messiah. Charles Jennens (1700 – 1773), the man behind the words, was an English landowner and patron of the arts. Jennens was brought up in Leicestershire, in the mid-lands of England. He was educated at Oxford but did not graduate. He was known in the community as a devout Christian and identified as an anti-Deist with an interest in primitive or early Christianity. Jennens had a deep knowledge of the Bible and from about 1735, he contributed many Biblically-based books to Handel’s music. These include oratorios such as Esther, Saul, Samson, Joseph and His Brothers, and Belshazzar. He had a background in music and literature and always made notes on his copies of Handel’s works giving suggestions that he thought would make the entire work more Scriptural. Their most famous collaboration is Jennens’ text for Messiah. By his account, he wrote the book focusing on Jesus as Messiah with the text taken entirely from the Bible. The work is structured in three parts originally named The Promise of Redemption, The Price of Redemption, and The Power of Redemption. Part I begins with the prophecy of the Messiah and his birth, the annunciation to the shepherds, and reflects the Messiah’s deeds on earth. It is taken from the books of Isaiah, Haggai, Zechariah, Malachi, Matthew, and Luke. Part II covers the Passion and includes mentions of Jesus being despised of men, His death, burial, resurrection, and ascension in Heaven. Part II also includes a section on the spreading of the Gospel and its rejection. The Hallelujah Chorus concludes Part II in a scene called God’s Triumph. Part II includes Psalms, Lamentations, Isaiah, John, Romans, and Hebrews. The Hallelujah Chorus was drawn from the Book of Revelation. Part III includes verses from Job 19 concerning the coming Messiah. The remainder is drawn from Paul’s teaching of the resurrection of the dead and Christ’s glorification in heaven from Romans, I Corinthians, and Revelation. The work concludes with the Amen Chorus. Jennens described his work as “a meditation of our Lord as Messiah in Christian thought and belief.” Handel first estimated that it would take a full year to compose the music, but the 260 pages were completed in an astoundingly short period of about 24 days during August and September 1741. He made a note in his writings when he finished writing what would become known as the Hallelujah Chorus. He said, “I did think I did see all Heaven before me, and the great God Himself”. At first all his oratorios were met with outrage from the established Church with many leaders prohibiting their members from participating in any way. They did not think it appropriate that a Bible story was being told by common actors and singers and the Word of God being used as the text. The Bishop of London prohibited the oratorios from being performed. When Royal Family attended, they were met with success but despite the support of the Royal Family, churches remained angry and continued to tear down the advertisements and disrupt the performances.